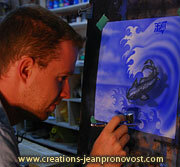 Developing his skills for more than 15 years, Jean Pronovost has more than a passion for airbrush. Now a master in this technique, his reputation is international. 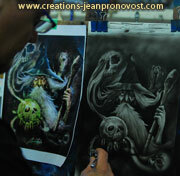 In fact, he was one of the guests for the 2008 edition of Airbrush Magic in Switzerland, reuniting the best European artists of this amazing art form. Through this school, Jean Pronovost wishes to share his passion with you. 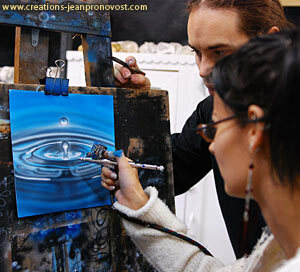 Airbrush is a highly precise tool: it requires a very demanding training and know-how. By meeting us and participating in our classes, you will have the advantage to work in a real artist workshop among oil paintings and sculptures. Also, you will have the best service from passionate and rigorous professionals. Our strength is to advise you in the best materials since we are also the Iwata’s brand representative in Quebec. Iwata’s airbrush has been our favorite for 15 years because they are simply the most efficient. Our classes are developed having in mind to provide you with the best following. We will adapt our learning methods to your needs. Our leitmotiv for our creative enterprise is the same for our school: “Our daily goal is to provide you with an optimal result. Your entire satisfaction is the base of our reputation”. We wish to satisfy you beyond your expectations in our forthcoming personalized classes. 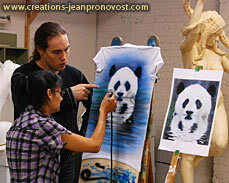 Airbrush classes, Montreal city, Quebec. 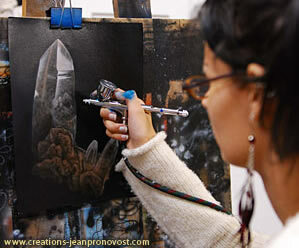 Les Créations Jean Pronovost put together their experience and advanced skills in airbrush used in the development of Arts and of the population offering a bran new airbrush classes concept designed for beginners and advanced students. 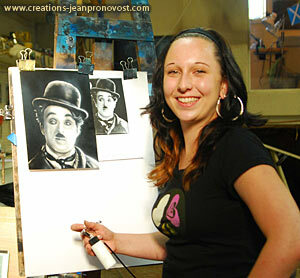 These classes have been designed for people interested in learning or improving their personal airbrush abilities. If students have the ambition, they can pursue the classes for a professional use.To register for the courses, each student must have his own equipment (aerograph, paint, etc…). I recommend the HP-BC Plus or HP-C Plus airbush from the brand Iwata from whom I am now an official reseller in Montreal. We supply the compressor. 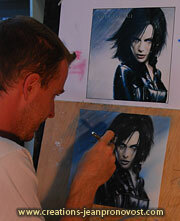 Basic classes are deeply taught, special workshops will also be given in order to deepen some techniques and aspects of airbrushing (preparation of many surfaces, airbrush on many frames, varnish, etc…). These classes are usually 3 hour long and are given in small groups (6-8 persons). Private lessons are also available. Registration fees and schedule are adjusted according to the demand, to the participant’s number and are subject to change without notice. Please note that the private lesson are available for a 50$ supplement. Because the group class are not always available, we offer private lesson. Check the class outline and schedules below. Be sure to read all the informations before contacting me. Course no. 1 Initial training. 150$ (private 200$)– Mechanism and airbrush application. – Explanation on the specific use of each airbrush type. – Different types of paints and mediums that can be used with each kind of contract. – Compressors and several instruments. Course no 2. Masks and Stencils I. 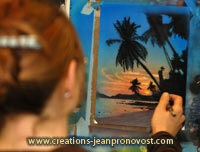 150$ (private 200$)– Demonstration of methods and use of stencils available on the market. 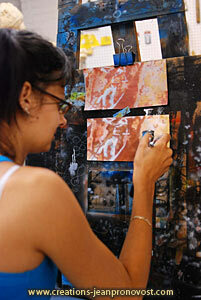 – Creativity and manipulation in order to create size and depth effects. – How to achieve striking effects and the development of this technique. Course no 3. Masks and Stencils II. 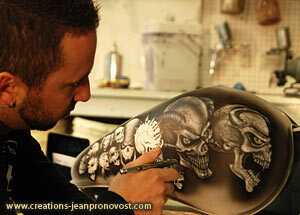 Montreal airbrush school150$ (private 200$)– Fret work approach in making your own masks. – List of all the equipment that can be used in the making of a mask. – Painting created with a mask made and cut from a drawing, an illustration, a picture, a lettering or a logo, depending on the student’s choice. Course no 4. Freehand I. Course no. 5 Freehand II. – Produce several faux fini such as marble and demonstration with secondary instruments. 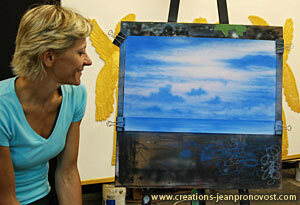 150 $ (private 200$)– Paintings and additives to be used. – The proper masks and the proper t-shirt procedures. – Techniques to ensure the t-shirt toughness and durability. Course no 8. Leather jacket. 150$ (private 200$)– Surface preparation. – Paint and proper techniques. 150$ (private 200$)– Several reproduction techniques of the human and animal portraiture. – From realism to hyperrealism, everything is possible. 150$ (private 200$)– Several techniques of skull reproduction. – Masks and stencils that can be used. – Completion of different skull styles. Course no. 1 and 2 Introduction and Further Extension. 400$/ 2 courses (private 500$/ 2 courses)Airbrush car bodyworkProject preparation.– Sanding, primers. – Basecoat and dressing technique. – Appropriate masks and stencils. – Kandy’s painting and transparencies. – The finish with airbrush paintings on that type of project. 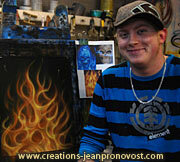 150$ (private 200$)– Produce flames of several styles such as realistic or stylize. – Every step of the masks conception, personal ones or those available on the market. – The different colours and transparencies. Each class is 3 hour long. Each price is subject to change without notice. Private courses are available for a 50$ supplement. Shedule are ajusted for the coveniance of the students, please contact me one week earlier to reserve your place. To get more information or to register to a class, please contact Jean Pronovost at this number: 514-835-7438 . 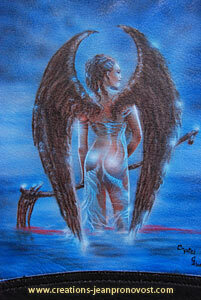 Thank you and I am looking forward to helping you to learn and improve the airbrush. I will then have the opportunity to communicate and share my passion about this profession. 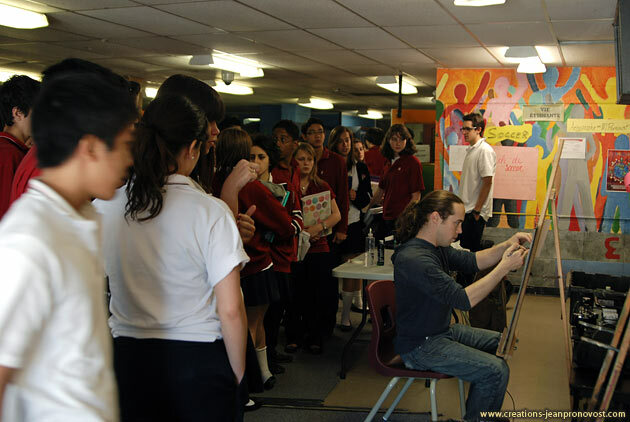 Jean Pronovost was inviting earlier this summer for an airbrush demonstration at Saint-Louis de Lachine School during an afternoon dedicated to culture. 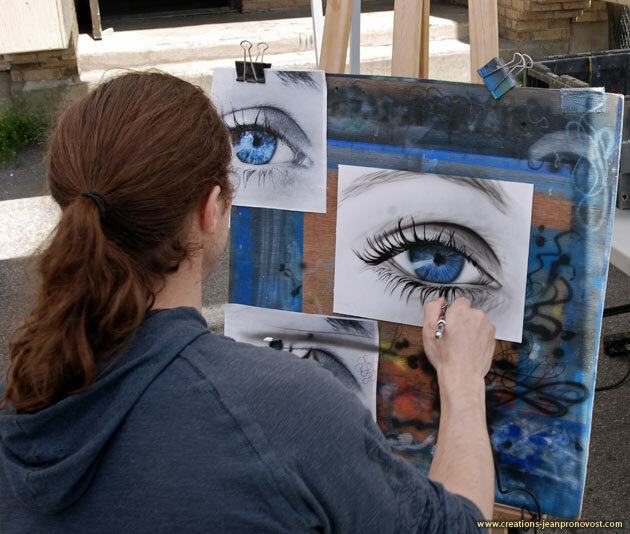 Jean Pronovost has chosen to illustrate an eye using airbrush and to show this technique to the students. The young folks showed a particular interest and care to understand this technique. The most repeated word was “Magical”. 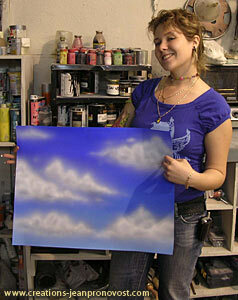 Airbrush provides lots of amazement from young people in general. Jean Pronovost is filmed for the Saint-Louis School’s archive of this day dedicated to culture. We see on this picture that the illustration will soon be finished. 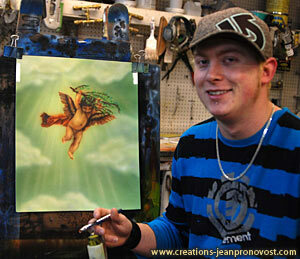 Jean Pronovost adds a final touch to this impressive illustration realized with airbrush. Jean Pronovost is often invited to participate at this kind of event. It’s always a pleasure for him to share his passion with others. 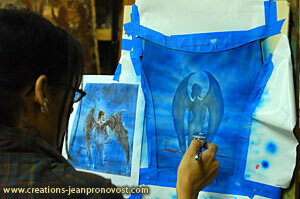 Airbrush is a creative passion which, once transmitted, can become the means to realize one’s dreams for many.